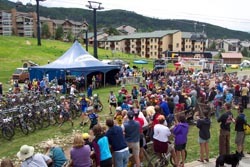 Come out west and race with us in the Rio Stampede at the Steamboat Ski area. Legendary climbs and aspen-studded single track await you for this test of skill and endurance. Race either 12 or 6 hours with a team or solo. Not in the best of shape, get your work pals together and race in the corporate division. Now in its 5th year, the new format replaces the established Rio 24 hours of Steamboat. "We are looking for ways to get more people involved," says veteran event promoter Katie Lindquist. "We believe the format change will attract a great field of competitors creating an experience to be remembered." Shaking up the endurance racing scene organizers say will allow participants to ride it all in one day! "The only change from the 24 hour race is the clock," says co-director Brad Cusenbary. "We are the same organizers with the same great sponsors holding this race at the same spectacular venue. Festive, faster and local, you can't go wrong!" Rocky Peak Productions is a cycling event promotion company. Its founders and directors are cyclists who provide other cyclists outstanding events for competition and fun. Our office is located in Steamboat Springs, Colorado and we welcome your comments or questions anytime. To learn more about this terrific event check out www.rockypeakproductions.com. Make sure to register early for great savings.